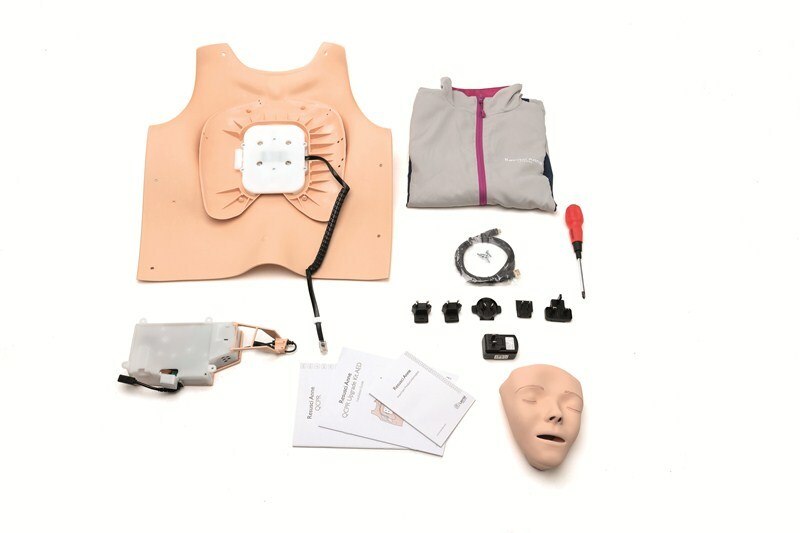 The RA QCPR upgrade kit include the new electronics including Bluetooth Low Energy (BLE) and rechargeable battery in addition to required cables, a new chest skin and clothes. The makes your manikin ready for use with the new apps and SimPad Plus (blue button). The upgrade kits are designed so the customer can do the installation themselves, without the use of tech services or any additional tools - even the screw driver is included. Do you use SimPad Classic or PC SkillReporter? The SimPad classic (yellow auxiliary button) will not work with your manikin after upgrading. The electronics in the kits currently work with PC Skillreporter software on cabled connection only. Check the PC SkillReporter web shop for more information. The RA QCPR upgrade kit include the new electronics including BTLE and rechargeable battery in addition to required cables, a new chest skin and clothes. All Resusci Anne QCPR and Resusci Anne First Aid manikins manufactured since 2013 can be upgraded. Older Resusci Anne manikins do not have a design that fit with the upgrade kits. *) For Resusci Anne First Aid it is required to install the 171-20050 RA QCPR Periodic Maintenance kit when upgrading. The lung plate in the kit contains sensors essential to QCPR measurements. These customers must choose the bundled options, 171-15010 or 173-15010. **) Resusci Anne QCPR-D/QCPR-D AW can be upgraded/converted to AED-Link version for use with ShockLink. The possibility to use live AED or defibrillator with paddles or training cables will be invalid if upgraded. There is no option to upgrade the electronics in RA QCPR-D/RA QCPR-D AW without converting the RA manikin to AED link for ShockLink. Resusci Anne FA/QCPR manikins released after 2013 have the jack socket hole for the SkillGuide in the shoulder - earlier versions of the manikins do not have this hole. The hole can be plugged or not. Resusci Anne Advanced SkillTrainer and Resusci Anne Simulator also have this hole, but they can be separated from the Resusci Anne QCPR/FA by having the Lithium-Ion battery inside. It is also possible to identify the manikins by looking at the article number in the identifier tag under the skin.